If you didn't make it to the club last night to view Tom Putt's presentation you really missed out. We've had Tom present at our club numerous times over the years and we've been fortunate enough to watch his progression through different genres of photography. 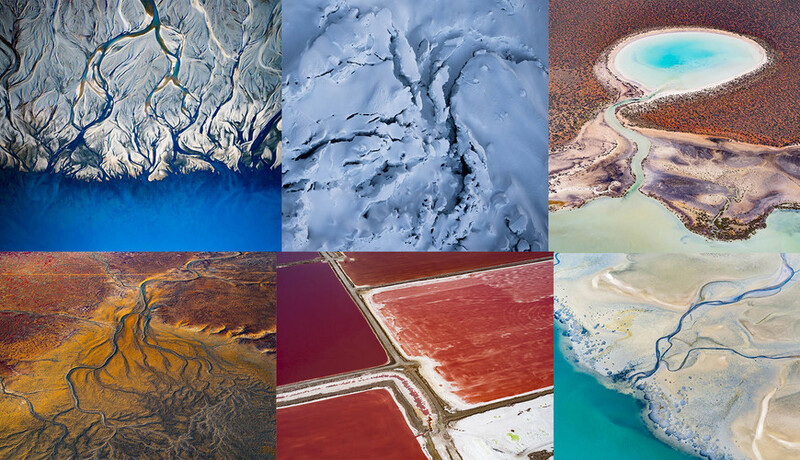 His current passion of Aerial Abstract Landscape Photography is something he really excels at, especially for someone who is scared of heights. Those of us in attendance were given a sneak peek of some of Tom's (at the time) unpublished work which will take centre place in his new gallery (139 Main St, Mornington VIC) opening November 22. If you find ourself down that way, you can drop in and say "Hi" to Tom who will be manning the gallery when he's not off on an adventure or conducting one of his amazing photography workshops (which you can join) here and overseas. We thank Tom for his visit and sharing his knowledge with our club. Tom's an energetic and inspiring presenter we're grateful to have when he can fit us in to his busy schedule. 24-105mm (or similar) is the ideal lens. Wider and you tend to get too much of the craft you're in in the shot. Subject matter. If it's a popular location, consider how you may make it your own. Lines patterns, shapes, colour and contrast. Pilot experience is important. Those who conduct these types of flights will more often be in the know and will understand the needs of the photographer. Height levels. Vary them where possible. Watch your horizons. Ideally you want them straight when taking the photo so you don't lose parts of your scene in post processing when you have to rotate to fix a dodgy horizon. Tom likes to have as close to a "looking straight down" view as he can get. It's not always possible when your craft has landing gear that may get in the way. He has some tricks for altering the perspective. Shoot in Shutter Priority, 1/500th and above. Your craft can be moving quite fast so you need to ensure you're not going to come back with a bunch of blurry images, particularly if you're in an aeroplane. ƒ4 to ƒ8. Lens sweet spots typically sit around ƒ8 or ƒ11 though these can be too high given the other settings you might need in your exposure triangle. Depth of filed form thousands of feet up isn't really an issue. ISO 100, 200, and on occasion 400 when the light doesn't allow the apertures you want to use without pushing your ISO. Turn on high-speed shooting to get a range of shots and for doing aerial panoramas you will stitch together later. Clear your card before you head out, you'll take a LOT of photos. Unpredictable - they can be hard to control, may go off on their own if flown over water, near areas with a lot of electrical or radio interference. Stigma - There's a certain community feeling that drones are for spying. Limited access - Restricted from a lot of cities, national parks, built up areas, or where people are present. Weather dependent - Can only tolerate wind speeds of up to 20kph. No flying in precipitation or fog. Limited availability - we don't get to carry them around with us, we need to hire a qualified pilot. Can cover greater distances (hundreds of kilometres). Better quality - You're using your DSLR, ideally with no impedance (ie though and open door, window, rather than though glass). Access all areas - aircraft can fly anywhere their flight plan is allowed. Manoeuvrable - move around easily with the right pilot. Tom doesn't do a lot of post processing, in fact it's all mostly done in Lightroom. So too is the transform tool to alter perspective. Add a bit of contrast and saturation (or desaturate as required). Fix your horizons if you need to, but ideally you would have made these straight in camera. Tom also recommends we checkout the work of other aerial photographers and also to checkout the movie The Secret Life of Walter Mitty for the imagery. *Note: these prices are what Tom has found himself paying. Rates will vary depending on provider.